We'd like to thank the following businesses and organizations for aiding in our fundraising efforts. If you have an idea for a fundraiser or would like to learn more about how you can get involved, please email us at info@marisas-mission.org. 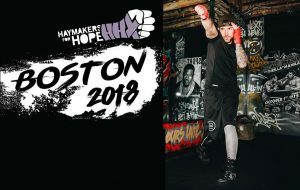 We are so grateful that fellow Braintree native, Ryan Hogan chose Marisa’s Mission as his charity to support for Haymakers for Hope this year! Ryan spent four months training hard for his first fight at the Rock and Rumble VIII event that was held on May 17, 2018 at the House of Blues in Boston. Ryan’s passion and dedication to this fight is matched alongside his passion to help those fighting cancer. Not only did Ryan prove to be a fierce competitor in the ring, he also raised a WHOPPING $12,425 for charity, over $6,000 of which went directly to Marisa's Mission! We are so grateful, Ryan. THANK YOU and CONGRATS! We want to give a big shout out and a huge thank you to Samsonite for choosing Marisa's Mission as one of three local charities to support for their "Think Pink Friday" event. 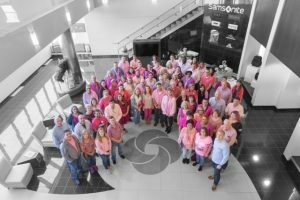 On October 13, 2017 Samsonite donated $20 for each employee who came to work wearing pink. Thanks to the 321 employees who participated, Marisa's Mission received over $2,000! We feel honored and know that this will be a tremendous help for patients and their families that come to us for assistance. Thanks again for helping us make a difference Samsonite! 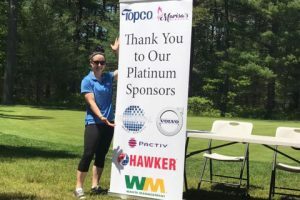 Thank you Topco Associates for choosing Marisa's Mission as your charity to support at the 5th Annual Golf Tournament at Pinehills Golf Club in Plymouth. All proceeds from this event benefited Marisa's Mission and we couldn't be more thankful for their support! We had such a great day enjoying the beautiful weather, delicious food, and great people! Thanks again Topco!